So how’s this juice cleanse going, you ask? I do NOT drink enough water. Or enough, period. This juice fast is making me pee every hour. Sorry. TMI. But seriously. I am getting super hydrated. 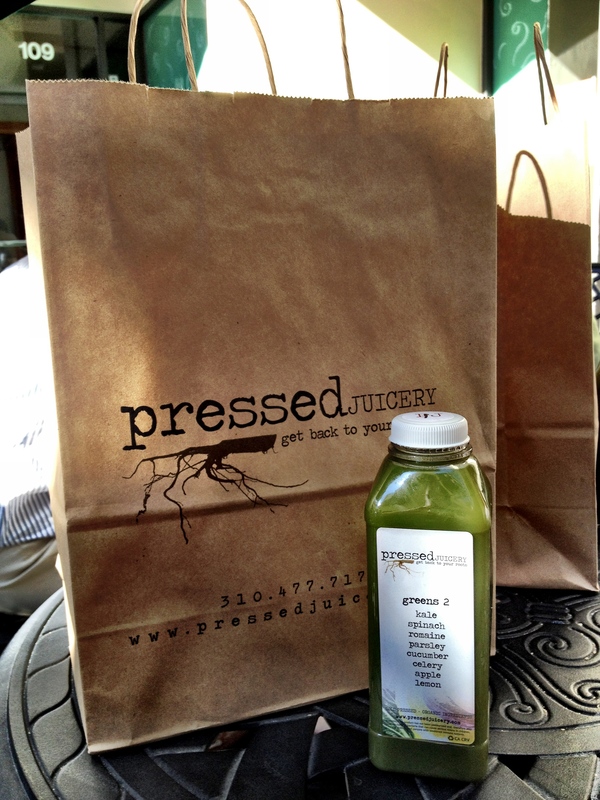 So Suzi, Deva and I met up at Pressed Juicery yesterday morning in Brentwood and picked up our first day’s worth of juice. Only $45 when you pick it up in person as opposed to the $70 if they deliver it to your door. Score! 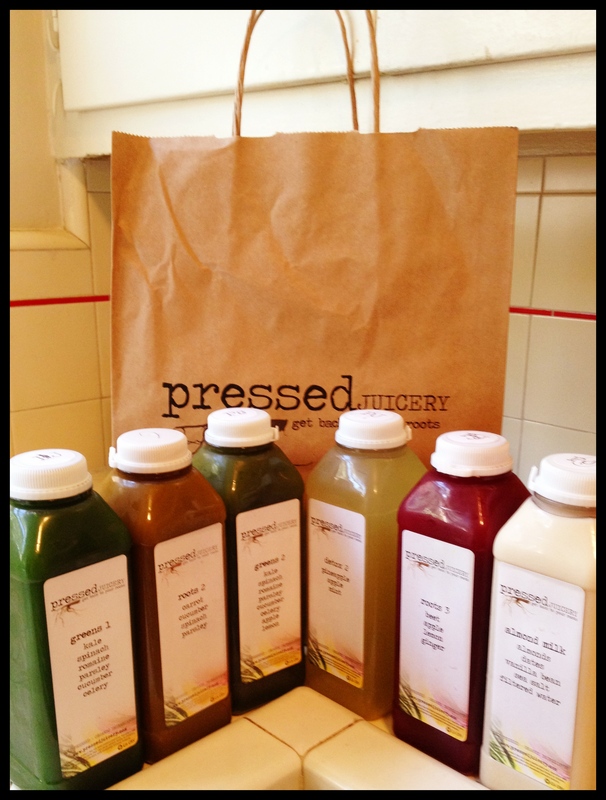 What Pressed Juicery does is it takes all of the guesswork out of a cleanse. They freshly press their juices every day and put together a plan for you that is well balanced and effective. All you have to do is drink the juices in the order they tell you to and have a juice every 2 or 3 hours. Super easy. Don’t think, just drink (juice). And then all three of us went into work, where we serve hundreds of cheeseburgers and fried chicken sandwiches and french fries and martinis and beer every day. I imagined it was going to get ugly. But by the end of our five hours of torture, we had all gotten up to drink #3 for the day. Suzi was going through coffee withdrawals, I couldn’t get away from the smell of bacon and Deva was drooling over a bag of Kettle Corn – but we all made it out alive. And we did it all without solid foods. So I headed home, where I knew I’d be alone for the next 6 hours or so, and I popped open another juice (#4 for the day). I had to keep myself busy, so I walked down to Walgreens and picked up a few things we’d been needing. Then I cleaned the entire bathroom. Then all of my neighbors started cooking dinner. I smelled pasta. I smelled some kind of stir fry. I drank another green juice to stay distracted. I started to think maybe I could do this for five days instead of three. Because what good can three days really do? The guy in “Fat, Sick, and Nearly Dead” did 60! I can do five!! Maybe ten!!! I snapped back to reality. Three is plenty. Remember how good Brad’s cooking is? Smell how good that dinner next door smells? Three days is probably enough. So… I watched another movie. Then I wrote in my journal a bit. Then I wandered into the kitchen and saw the cherry tomatoes and fresh greens still in the fridge from the farmer’s market this week. Can’t I just eat a cherry tomato? It’s basically what I’m drinking anyway. Practically liquid, too! I actually picked up a tomato before realizing what I was doing. I put it back down. Later, I almost ate a grape. I put that back down, too. And then Brad finally got home. Distraction. 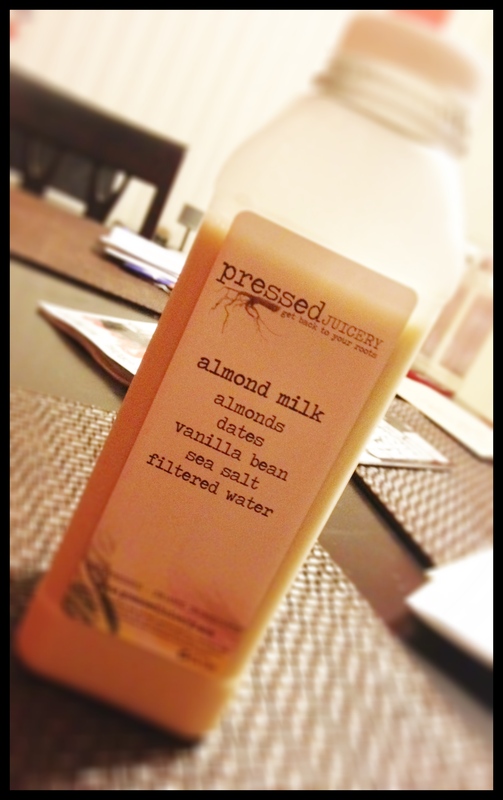 I opened my final liquid for the night, almond milk, and it tasted like no other almond milk in the world ever has. It was like I was drinking a milkshake. A fluffy, vanilla milkshake. It was heaven in a plastic bottle. Juiced, but delicious. Yesterday might have been a little crazy, but it wasn’t so hard. I realized how much I mindlessly eat, even if it is healthy foods. 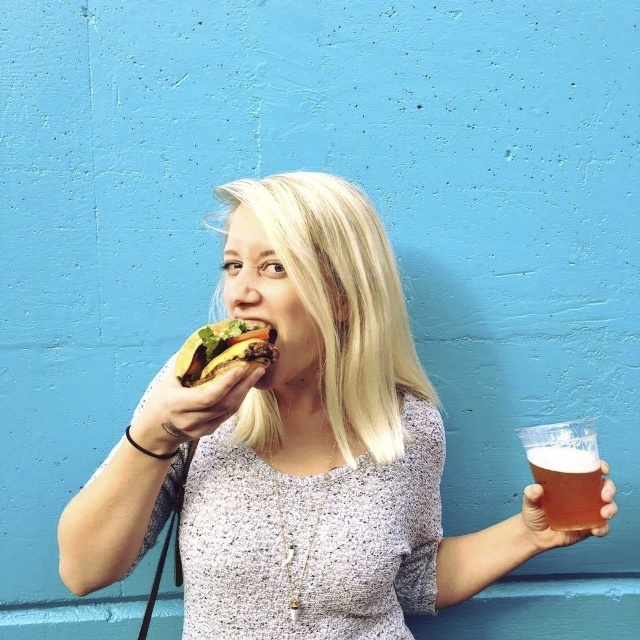 I realized that my entire Twitter feed is about food and that everyone I follow on Instagram takes pictures of food. Facebook was the only place I was semi-safe, because there are usually a lot of baby and dog pictures mixed in with the amazing dinner pictures. Even if I was watching TV and refrained from the Food or Travel networks, the commercials are all about food. 90% of my bookshelf consists of books about food. And even my Flipboard categories? Mostly food related. I am surrounded!! All of this isn’t a bad thing, though. It’s who I am, what I love and the food and wine industry is an business that I have built my life up around. When done in a healthy way, it is an amazing way to live!! But having to separate yourself from those smells and tastes and textures makes you appreciate them that much more. It makes you think more about the value of what you’re putting into your body everyday. Can you tell I am still sort of trying to convince myself of all of this? Packed with a big tin of my dad’s famous chocolate chip cookies. 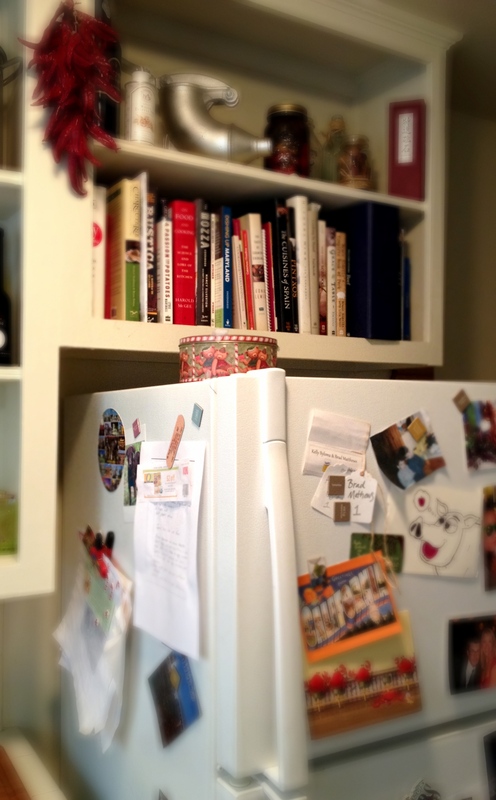 Which are now hiding way above my line of sight on top of the refrigerator. See them up there out of my reach? Sigh.